There are a lot of reasons to run. Some of the health benefits are strengthening the immune system, reducing stress and losing weight. Even a moderate amount of exercises, like running once a week, can have considerable positive effect on one’s health. Running isn’t just an important part of individual and team sports, but also its own discipline. Based on the ability to sprint an athlete can have a decisive influence on a match or break records. This skill needs to be trained. SmarTracks Athlete offers the perfect solution and is a must have for professional and ambitious amateur athletes who want an accurate running analysis. Distances, speed, step frequency, sprint and interval times are measured effortlessly. You can run anywhere with the App’s Free Run option. Or you can choose the Record Run to run on tracks with the SmarTracks Timing Gates, which allows for an even higher measuring accuracy. 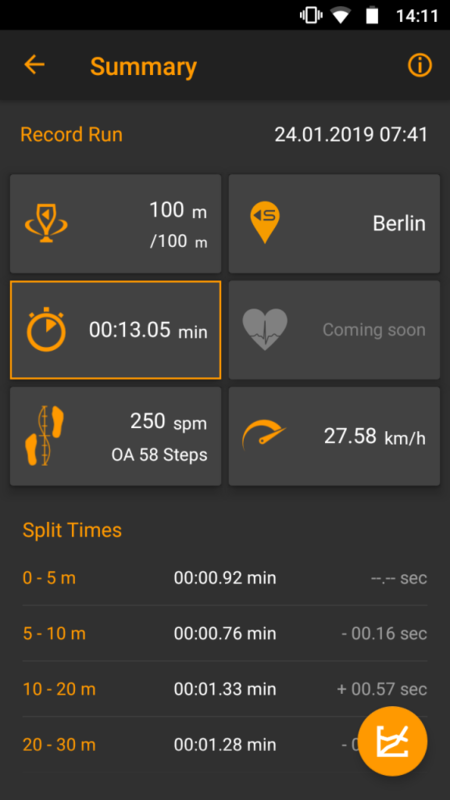 SmarTracks Athlete is an Android application that, with the help of sensors in the smartphone, records all relevant parameters and displays them directly. Simply put the smartphone in a running belt at the height of the lower back, and the app will measure all important running data, such as distances, speed, time, and step frequency. You can use the SmarTracks Athlete App anywhere you want to run, whether it is on your club’s running track or on the streets. If you run on the street or a running track without our Timing Gates, choose the Free Run option. It will give you your distance, time, speed and step frequency. If you run on a running track that has our Timing Gates In-Ground, choose the Record Run option. Running on tracks with integrated Timing Gates will give you not only distance, time, speed, number of steps and step frequency, but also accurate interval data. You can check where to find SmarTracks-enabled running tracks here. You can find more information on how to use the app on our User FAQ page.